AURORA, Ill. – May 16, 2017 – Peerless-AV®, the leader in innovative audiovisual and mounting solutions, is pleased to announce the launch of its Hospitality Wall Arm Mount with Set Top Box (STB) Enclosure (HA746-STB). Ideal for hospitality settings, including lobbies and hotel rooms, the articulating wall mount is equipped with a clean and modern design that is easy to install. 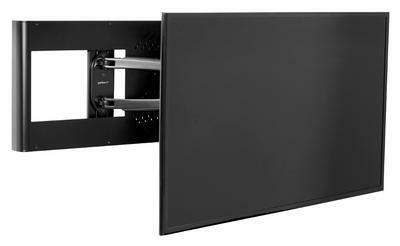 Compatible with 43" to 55" hospitality TVs, the wall mount conceals the STB or cable box with a vented, secure cover that provides a clean finish, hiding electrical equipment and cabling from hotel guests. The simple removable cover is interchangeable to allow the STB box to be placed on either side of the mount, and can be easily removed which allows for quick access, while the mount’s open wall plate design allows for easy access to the wall or junction box, making maintenance seamless. For safety assurance, the mount is UL rated, enduring load testing up to four times the stated load capacity. Peerless-AV’s new Hospitality Wall Arm Mount with STB Enclosure is available through Peerless-AV direct sales representatives and authorized distribution network. For additional information, please visit https://www.peerless-av.com, http://www.facebook.com/PeerlessAV, and twitter.com/PeerlessAV.